In Africa, just 25 kms south of Nairobi, is the Rudolf Steiner school, established to provide education and a safe living environment for orphans and other vulnerable young children in Kenya. Kenya has a total population of around 40 million people, most of who live below the poverty level of around US$1 per day. UNICEF estimates that there are about 2.3 million orphans in Kenya – about 1 million of whom were homeless. The school project runs under the guideline of LEAF which is an acronym for ‘Love, Educate, Acknowledge and Feed’. The majority of the children’s parents died of HIV and without this school the children would be totally lost. http://www.africanleaf.org.au/. With lots of love, the working staff, most of them volunteers, provide these children with a basic education and feed them with at least one meal per day. The school operates only on donations. One of the main donators is Sibylle Bartel, who visits the school on a frequent basis and who also sponsors some of the children. Dr. Volker Bernhardt “DrGolf” heard about the project from Sibylle, who is a golf student of his. He decided to help with the Golf Charity World Tour (golfcharityworldtour.com). 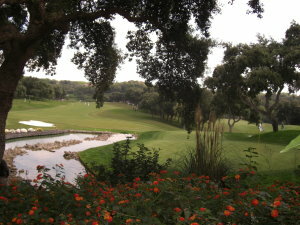 He contacted Valderrama (www.valderrama.com), the number one Golf Course in Europe and got an immediate green light from the new director of Golf Javier Reviriego for support. With the donated Greenfees from Valderrama and capitalizing on the notoriety of the golf course (host of the Ryder Cup 1997 and destination of two World championships and one European Professional Tour Events per year) Volker raised US$ 6800 for charity. The majority came from Sibylle who unfortunately could not play due to an urgent eye operation in Germany. We wish her all the best. Sibylle nominated her good friend Christa Spänhoff for the game. Christa is also a strong supporter of charity work. 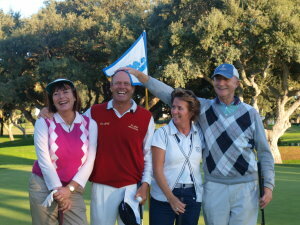 Apart from DrGolf and friends, the Dutch couple, Lia and George Burg, were also co-sponsors. 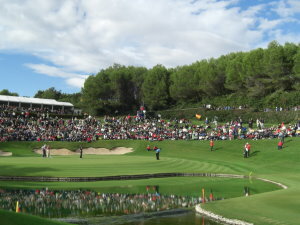 The three players ( Christa, Lia and George) who challenged „DrGolf“ had all high handicaps and therefore the scramble playing format was adequate for such a difficult golf course like Valderrama. The game was a great highlight for all players. Blue sky, the sun was shining warm and the golf course was in perfect playing condition. DrGolf played in outstanding form and with several birdies and solid par golf he became an early winner of the game. For Volker however it was most important that everybody had a great golf day and that the game was for a good purpose. Christa Spänhof recieved the symbolic cheque in the name of all donators and with it a better Christmas for the children in the LEAF school is guaranteed. If you are a golfer and would like to donate any charity amount above US$ 3000 to your chosen charity you can call Dr. Volker Bernhardt “DrGolf”(+34 630 794 369) and he will host a charity event for you without any charge.